They say it’s supposed to be one of the coldest winters in Austin, TX. And I’m fine with it. After one of the hottest summers, bring on all the cool. I traveled to Canada with some girlfriends this past September and the 30-degree-snow-flurrying temps had me feelin’ all the winter feels – a whole lot earlier than usual. I was excited to specifically put a little warmer pep in my step with the cutest little Koolaburra sheepskin booties. What’s Koola? I didn’t know either! 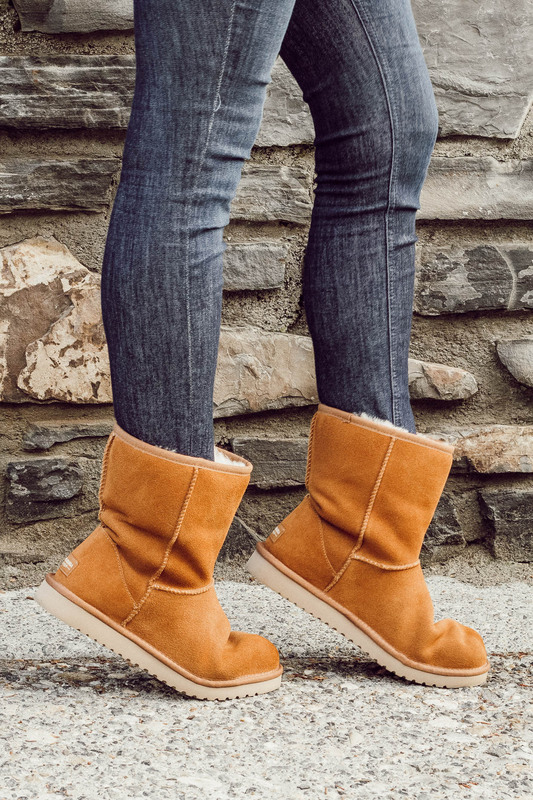 Meet UGG’s darling sister brand – dedicated to the same great quality and style of UGG – but lighter on the wallet while emanating a cool, effortless, and wearable style. Ideally designed for the Cali gal – and us Texas gals (when temps hit freezing in Dec and Jan) – Koolaburra offers cute, short-boot UGGs (like the one I’m wearing in this post) + tons of under-$100 laid-back kicks. 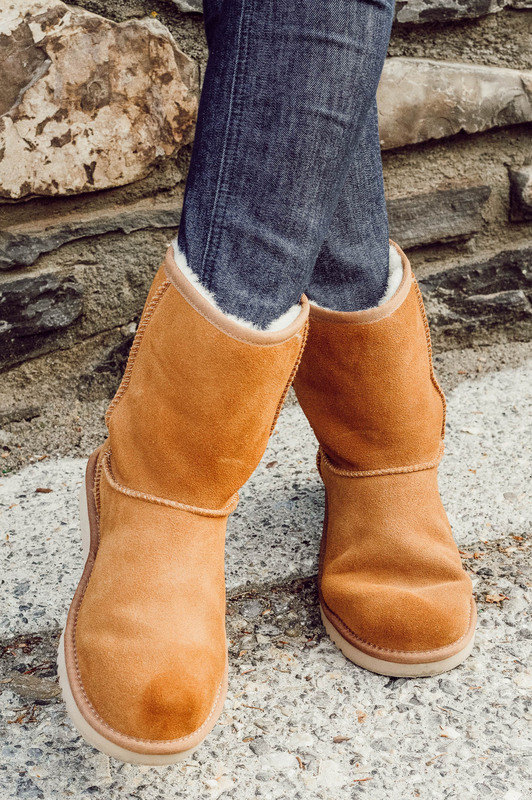 Effortlessly chill and a lil’ bit more affordable – thanks for the new sister brand, UGG. My favorite part about owning boots like these? They are actually my-most-worn-winter shoes in Texas. Being a puppy mama – quickly throwing on a pair of sheepskin-lined boots (with leggings and a coat) during cold winter nights [and days] is essential when taking little Chloe on walks. I styled these boots in Canada with a leopard print sweater and denim, but also love the look of short sheepskin boots with a casual outfit pairing – leggings and a sweatshirt (cute, cozy). Find the rest of Koolaburra’s products here, and click the thumbnails below to shop some of my personal favorites! Thank you, Koolaburra, for sponsoring this post. All opinions are my own. Great post! Your pictures from Canada are gorgeous, and these boots look so warm and fluffy. I still think they’re hideous as can be, but I bite my words and appreciate them when it snows here lol! Love this look! I can’t wait for cooler temps! 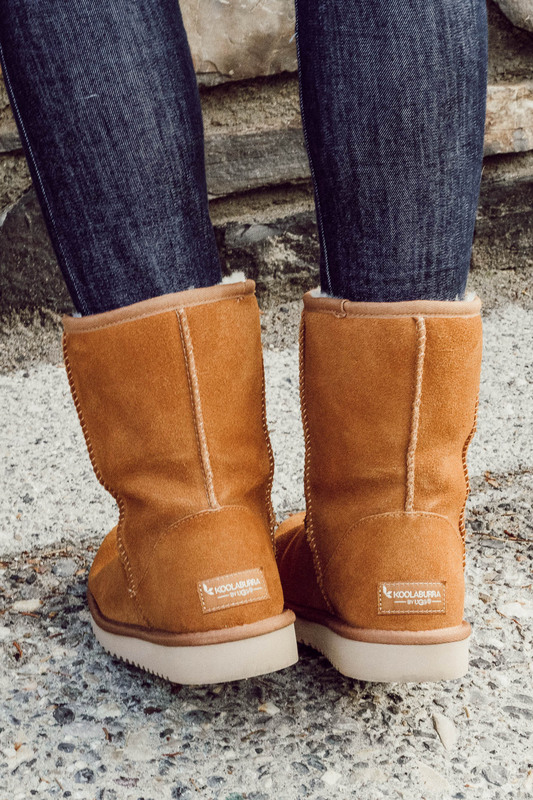 I love how easy it is too throw on my Uggs! Especially when I need to take my dog outside! !